Improve your posture. Physical therapistswill teach you to ways to improve your posture. Whether it is simply pushing your chest out or pulling your shoulder blades backward and together, slight modifications to everyday living can make a vast improvement in posture. Sarah has noticed over the past 2 weeks that she has experienced a "pressure sensation" starting at the base of her head that travels to the front of her forehead when she is sitting at her computer for more than an hour. Her discomfort increases as the day goes on, but is less on weekends. She decides to consult her physical therapist to see if physical therapy can help. Her therapist discusses her symptoms with her, examines her, and determines that her headache is a tension-type headache resulting from tightness in the muscles of the neck. The therapist works with Sarah to treat her pain, increase her flexibility and strength, and improve her posture. The physical therapist also offers suggestions for making changes to her workspace. For instance, Sarah makes sure that her computer monitor is directly in front of her and at eye level; she buys a new desk chair; and she now uses a headset for her phone. She quickly notices that her headaches are much less severe and that she can work at the computer for longer periods of time. Soon, Sarah is headache-free. A physical therapist who is experienced in treating people with musculoskeletal problems. Some physical therapists have a practice with a craniofacial focus, meaning that they focus on movement disorders related to the skull and facial structures. When you contact a physical therapy clinic for an appointment, ask about the physical therapists' experience in helping people with headaches. 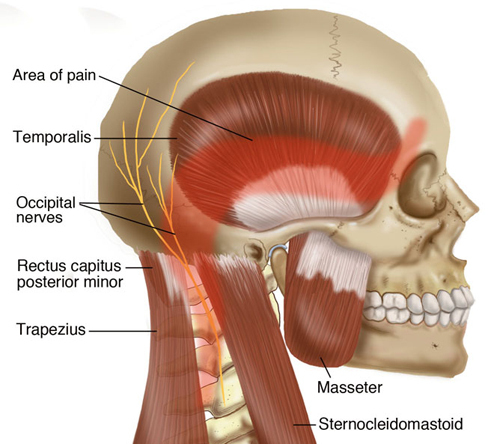 APTA has determined that the following articles provide some of the best scientific evidence on how to treat cervicogenic headache. The articles report recent research and give an overview of the standards of practice for treatment both in the United States and internationally. The article titles are linked either to a PubMed* abstract of the article or to free access of the full article, so that you can read it or print out a copy to bring with you to your health care provider. Becker WJ. Cervicogenic headache: evidence that the neck is a pain generator. Headache. 2010;50:699–705. Article Summary on PubMed. Hall T, Briffa K, Hopper D, Robinson K. Reliability of manual examination and frequency of symptomatic cervical motion segment dysfunction in cervicogenic headache. Man Ther. 2010;15:542–546. Article Summary on PubMed. Hall T, Briffa K, Hopper D. Clinical evaluation of cervicogenic headache: a clinical perspective. J Man Manip Ther. 2008;16:73–80. Free Article. van Duijn J, van Duijn AJ, Nitsch W. Orthopaedic manual physical therapy including thrust manipulation and exercise in the management of a patient with cervicogenic headache: a case report. J Man Manip Ther. 2007;15:10–24. Free Article. Authored by Eric S. Furto, PT, DPT, MTC, FAAOMPT. Reviewed by the MoveForwardPT.com editorial board.